• Rattlesnakes are also called pit vipers because they have a heat-sensitive organ known as a "pit" on each side of the head that helps them locate and aim at prey. A rattlesnake can detect prey that are as little as 1/10 of a degree warmer than their background. 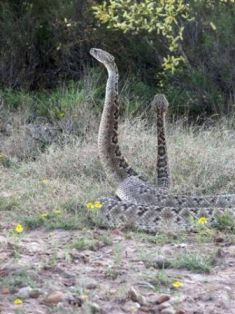 • Young rattlers leave their mothers at just a few weeks old, but when it’s time to hibernate in the winter, they follow their mother’s scent trail and use the same den. Future generations will also use the same den—some have been used for over 100 years.